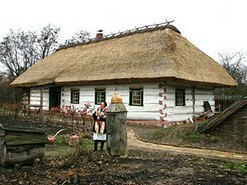 An village council head Rodion Starenkyj, to which reporters asked for comment, said the temporary ban on visiting the cemetery and the gypsies was introduced in 2011. According to him, the discontent of local residents is the fact that the gypsies "brazenly taken away the fact that people are Christian traditions brought to the graves of their dead relatives." Old added that his fellow villagers support the ban. "Also, we will act in the future" - he concluded. 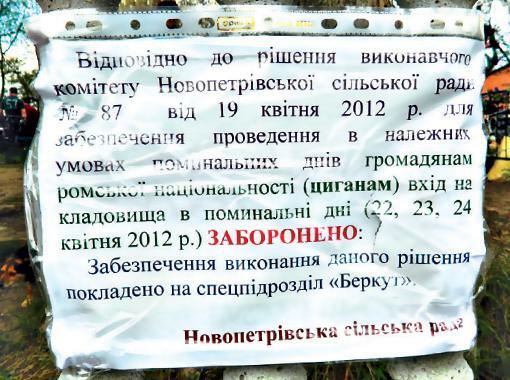 The "Berkut", standing at the cemetery gate confirmed that gypsies are not allowed. On the question of how to determine the membership of the respective ethnic group, one of the commandos said: "Yes, they can be seen, a specific nationality. By clothing, according to a person." Meanwhile, the press service of Kyiv Region police said they have no right to prosecute someone based on ethnicity. The Constitution of Ukraine (Article 24) states that do not allow limitations or privileges based on ethnic origin.